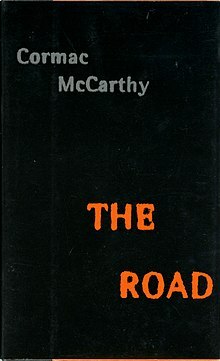 The Road is a 2006 novel by American writer Cormac McCarthy. It is a post-apocalyptic tale describing a journey taken by a father and his young son over a period of several months, across a landscape blasted years before by an unnamed cataclysm that destroyed civilization and, apparently, most life on earth. He pulled the boy closer. Just remember that the things you put into your head are there forever, he said. You might want to think about that. It took two days to cross that ashen scabland. The road beyond fell away on every side. It's snowing, the boy said. He looked at the sky. A single gray flake sifting down. He caught it in his hand and watched it expire there like the last host of christendom. In his dream she was sick and he cared for her. The dream bore the look of sacrifice but he thought differently. He did not take care of her and she died alone somewhere in the dark and there is no other dream nor other waking world and there is no other tale to tell. She was gone and the coldness of it was her final gift. And the dreams so rich in color. How else would death call you? Waking in the cold dawn it all turned to ash instantly. Like certain frescoes entombed for centuries suddenly exposed to the day. In those first years the roads were peopled with refugees shrouded up in their clothing. Wearing masks and goggles, sitting in their rags by the side of the road like ruined aviators. Their barrows heaped with shoddy. Towing wagons or carts. Their eyes bright in their skulls. Creedless shells of men tottering down the causeways like migrants in a feverland. The frailty of everything revealed at last. Old and troubling issues resolved into nothingness and night. The last instance of a thing takes the class with it. Turns out the light and is gone. Look around you. Ever is a long time. But the boy knew what he knew. That ever is no time at all. "The one thing I can tell you is that you wont survive for yourself. I know because I would never have come this far. A person who had no one would be well advised to cobble together some passable ghost. Breathe it into being and coax it along with words of love. Offer it each phantom crumb and shield it from harm with your body. As for me my only hope is for eternal nothingness and I hope it with all my heart." When he rose and turned to go back the tarp was lit from within where the boy had wakened. Sited there in the darkness the frail blue shape of it looked like the pitch of some last venture at the edge of the world. Something all but unaccountable. And so it was. They stood on the far shore of a river and called to him. Tattered gods slouching in their rags across the waste. Trekking the dried floor of a mineral sea where it lay cracked and broken like a fallen plate. Paths of feral fire in the coagulate sands. The figures faded in the distance. He woke and lay in the dark. I should have been more careful, he said. He’d had this feeling before, beyond the numbness and the dull despair. The world shrinking down about a raw core of parsible entities. The names of things slowly following those things into oblivion. Colors. The names of birds. Things to eat. Finally the names of things one believed to be true. More fragile than he would have thought. How much was gone already? The sacred idiom shorn of its referents and so of its reality. Drawing down like something trying to preserve heat. In time to wink out forever. He was beginning to think that death was finally upon them and that they should find some place to hide where they would not be found. There were times when he sat watching the boy sleep that he would begin to sob uncontrollably but it wasnt about death. He wasnt sure what it was about but he thought it was about beauty or about goodness. Things he’d no longer any way to think about at all. And perhaps beyond those shrouded swells another man did walk with another child on the dead gray sands. Slept but a sea apart on another beach among the bitter ashes of the world or stood in their rags lost to the same indifferent sun. Maybe you should always be on the lookout. If trouble comes when you least expect it then maybe the thing to do is to always expect it. Maybe he understood for the first time that to the boy he was himself an alien. A being from a planet that no longer existed. The tales of which were suspect. He could not construct for the child’s pleasure the world he’d lost without constructing the loss as well and he thought perhaps the child has known this better than he. He tried to remember the dream but he could not. All that was left was the feeling of it. He thought perhaps they’d come to warn him. Of what? That he could not enkindle in the heart of the child what was ashes in his own. Even now some part of him wished they’d never found this refuge. Some part of him always wished it to be over. Along the interstate in the distance long lines of charred and rusting cars. The raw rims of the wheels sitting in a stiff gray sludge of melted rubber, in blackened rings of wire. The incinerate corpses shrunk to the size of a child and propped on the bare springs of the seats. Ten thousand dreams ensepulchred within their crozzled hearts. They went on. Treading the dead world under like rats on a wheel. The nights dead still and deader black. So cold. Perhaps in the world’s destruction it would be possible at last to see how it was made. Oceans, mountains. The ponderous counterspectacle of things ceasing to be. The sweeping waste, hydroptic and coldly secular. The silence. You said you wouldn't ever leave me. No. I don't think he was lost. If I were God, I'd make the world just so and no different....so I've you, I've you. This page was last edited on 18 December 2017, at 21:36.